The WiSH Education Foundation will partner with KISS lead guitarist Tommy Thayer and author/animation legend David Feiss to debut the duo’s new children’s book and storybook app, “Ernest Hummingbird,” at Barnes and Noble in Valencia Saturday, March 31 from 1 p.m. to 3 p.m. 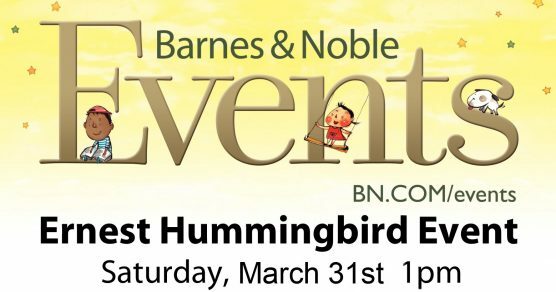 In a music-infused reading, sing-along and book signing, “Ernest Hummingbird” will take flight with a little help from Santa Clarita/Valencia residents Sara Rowe and Sara Niemietz, who will join Thayer and Feiss for the event. Sara Niemietz achieved fame as a standout singer for PostModern Jukebox, and was first discovered by Ellen DeGeneres and featured on “Ellen.” She has also performed on SCVTV’s “House Blend” music and interview show with host Stephen K. Peeples. The two Saras will join Thayer, who wrote and produced the music for “Ernest Hummingbird.” Feiss will also be on hand for the book signing and sing-a-long. “Ernest Hummingbird,” created by Feiss (“Cow and Chicken”), is a children’s story of a lovable young hummingbird named Ernest who wants to sing and not just hum. The book is paired with a storybook app (available on the Apple Store) and is narrated by Darius Rucker, country music artist well known for his Hootie & the Blowfish fame. Barnes and Noble is located at 23630 Valencia Blvd, Valencia 91355. WiSH supports programs and initiatives in the Hart District that are not funded by tax dollars alone. Grant funding is an integral part of any foundation’s budget and WiSH has been very successful because we have a great mission and we make a difference in the classrooms. Unfortunately, the WiSH Education Foundation lost the underwriter for our grant program. If your company is willing to help us continue this program through your donation and sponsorship, we would be greatly appreciative! Please contact Executive Director Amy Daniels at wish@hartdistrict.org. Find out more about WiSH and our upcoming events and news at www.wishscv.org. So excited to be a part of this great project! It should be a lot of fun Saturday:) We’ve worked on some really fun songs to sing so I hope everyone in Santa Clarita comes out!!! I am already HUMMING the songs and getting excited for tomorrow. Team Ernest are looking forward to seeing you tomorrow, Santa Clarita!